"It's a very sensitive situation." 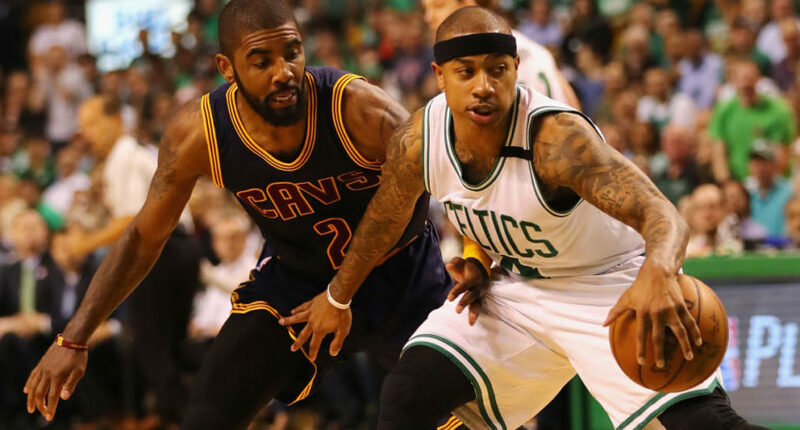 The Cleveland Cavaliers and Boston Celtics stunned the basketball world earlier this week when they agreed to a blockbuster trade that sent Kyrie Irving to the Celtics and Isaiah Thomas to the Cavaliers. However, it appears there’s still a chance the trade falls through. Sources: After Isaiah Thomas underwent physical today, Cavs still evaluating injured hip and weighing options w/ completion of Irving deal. Thomas traveled to Cleveland, took exam and flew back out of town, sources said. All players must pass physical, or a deal can be voided. As one source involved in the process involving Thomas' medical clearance told ESPN late Friday night, "It's a very sensitive situation." It’s the same hip injury that knocked Thomas out of the Eastern Conference Finals against the Cavs. So, it’s possible that Thomas doesn’t pass the physical and the Cavs to choose to void the trade, and… boy, that would be something. We already know that Irving demanded a trade in July, so he obviously doesn’t want to be back with the Cavs. And Thomas probably doesn’t want to be back in Boston after they just decided they wanted to trade him, following a season in which he finished fifth in NBA MVP voting. Jae Crowder was also sent to Cleveland in the trade, and he may not want to be back with a team that chose to trade him away either. It’s an uncomfortable situation for everyone involved. If the Cavs are left back with Kyrie, can they get anywhere near equal value in a trade for him again? Along with a star guard in Thomas and a starting-caliber forward in Crowder, they also got the Brooklyn Nets’ unprotected first-round pick from the Celtics, which could end up being the top pick in next year’s draft. The rest of the NBA has seen for themselves that the Cavs will indeed trade Irving as he’s requested, and if this Celtics trade falls through, it could hurt Cleveland’s leverage in other Irving trade talks. Instead of voiding the deal, Cleveland could potentially push for Boston to sweeten it — namely for another draft pick. For now, those are conversations still potentially to be had. What we know for sure is that it will be interesting to see the whole situation play out, and especially interesting to see these two teams play against each other Oct. 17 on opening night. Update: Adrian Wojnarowski reports that the Cavs will indeed seek additional compensation in the trade, and that Cleveland “could threaten to veto the trade” if there aren’t changes made to it. After Cleveland’s physical examination of Isaiah Thomas’ injured hip raised concern about the timeline for his return this season, Cavaliers officials are planning to seek an additional trade asset before finalizing a deal to send four-time All-Star guard Kyrie Irving to the Boston Celtics, league sources said. Without revisions to the original trade agreement, the Cavaliers could threaten to veto the trade, league sources said.